Viewing permitted. Commercial use and reproduction require written permission from copyright owner. Mr William Haxworth was working as the Chief Investigator of the War Risks Insurance Department of the Singapore Treasury when the war broke out. He was subsequently interned by the Japanese, first in Changi Prison and later transferred to Sime Road Internment Camp. He secretly drew over 300 small paintings and sketches that depicted the harsh, crowded and unhygienic living conditions in these POW camps. Faced with a shortage of paper and drawing materials, Haxworth creatively resorted to using whatever alternative materials he could lay his hands on to produce a variety of watercolour paintings and pencil and crayon sketches. With his keen artistic eye and daring sense of humour, his expressive portrayals of his fellow internees in various poses and from various angles undoubtedly entertained them to no end. 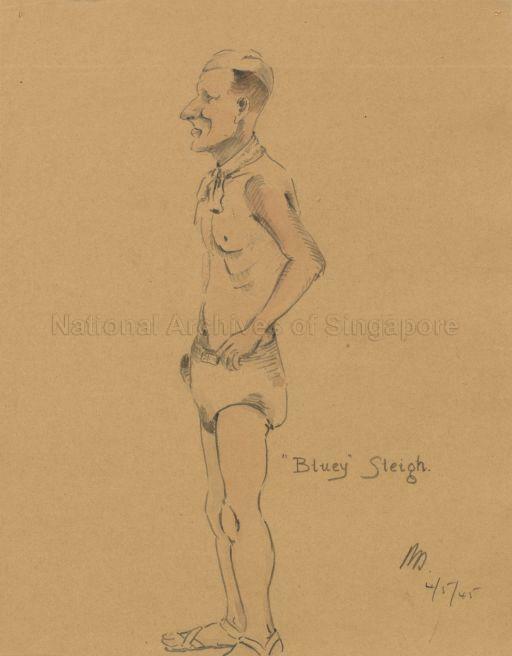 Over time, these drawings captured vividly the rapid transformation of the internees from well-built men to gaunt figures of skin and bones by the time the war is ended. Therefore, from archival point of view, these are more than just art, as they bear testimony to the consequences of an inadequate diet and other privations suffered during internment, and lay proof to the resilience and resourcefulness shown by the people in times of war and shortage. Seven drawings from this collection are currently being featured in the Virtual Collection of Masterpieces project, a collaborative effort of more than 50 museums from Europe and Asia to showcase and promote understanding of Asian masterpieces(http://masterpieces.asemus.museum). As a tribute to this spirit of creativity and adaptability, NAS in turn gave these wartime sketches new life and function by turning them into colourful window displays in the restored Old Ford Factory Exhibition Gallery which features the story of Singapore under Japanese Occupation, 1942-1945. More of Haxworth's artworks can be viewed online through the online exhibition - "Colours Behind Barbed Wires: A Prisoner of War's Story Through Haxworth's Sketches" (www.s1942.org.sg).